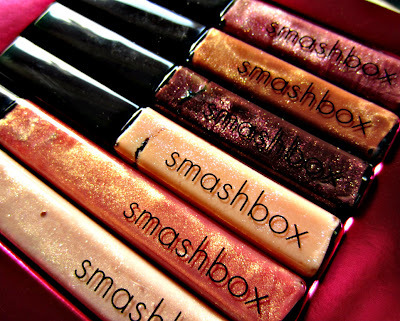 Day 2 of our 12 Days of Holiday Cheer Giveaway features the 6-piece lip gloss set, Wish For The Perfect Pout by Smashbox Cosmetics. Here's a reminder of the rules: Just answer the day's question (below) and leave your eMail in the comments (or check back to see if you've won if you don't feel comfortable leaving your address. You can then eMail me at mej0620@hotmail.com). U.S. residents only, Followers only (includes Google Friend Connect, subscribers, social media followers). 12 Days of Holiday Cheer Day 2 Question: Tell us something that's on your Christmas/Holiday list this year! I want a Keurig and a French toast maker.. but do to tight budgets just having the family together would be the best gift..we've all grown apart since my mothers passing.. Happy Holidays to you and your family! Honestly, one wish on my Christmas list this year is a car payment! Lol sounds terrible, but it would be a great help to me this time of year. Happy Holidays and thanks for the awesome giveaway! A new sofa is at the top of my Holiday wish list! this year I'm wanting a new camera! my old one is broken, and I really would love to take pictures again! I've got a lot of indie nail polishes on my list. I don't think my muggle family will know how to buy them but I can wish, right?! I've wanted a Kindle Fire all year and almost got one as a birthday present. I'm hoping I can buy one for myself next year if I don't get it this year. A Smart Phone would be on my list. An iPod is on my Christmas list. Yeah, I'm way behind the times, lol. I don't really have a lot on my wish list because I usually just buy whatever I want, but I would like some seasons of Doctor Who and Supernatural on DVD. I really want a clarisonic. I have several MAnglaze polishes on my list, they would make awesome stocking stuffers. Not a lot of beauty products since I usually buy those myself, and only get gifts from the BF and my grown son. On my list this year is a brand new Crosley portable record player! Yippee! I'd love to get a kitchenaid mixer! I want that over the door mirror jewelry armoire that's on HSN. One thing on my list that I really hope to receive is an electric tart warmer, I feel wasteful throwing out countless empty tealights to burn scented wax. There is a beautiful Calvin Klein top that I would love to get for Christmas! I would love the Clarisonic Mia2 Sonic Skin set. There actually isn't anything on my list this year. I already have everything I want. If anything what I want isn't materialistic- just to have a better 2013, as my 2012 wasn't that great!